Picture the scene: a hotel in Paris with journalists forming a small row in front of a glass table, which itself sits in front of an oversized sofa. There are young people with asymmetric haircuts stood in the door pressing on an earpiece and speaking into a microphone. They look like the Dalston FBI. There is a frisson of panic the air. It seems that their star attraction has gone missing. Maybe she took a wrong turn down one of the many snaking corridors in this maze-like hotel? Or maybe, more likely, she just decided to sack off her schedule and go her own way? 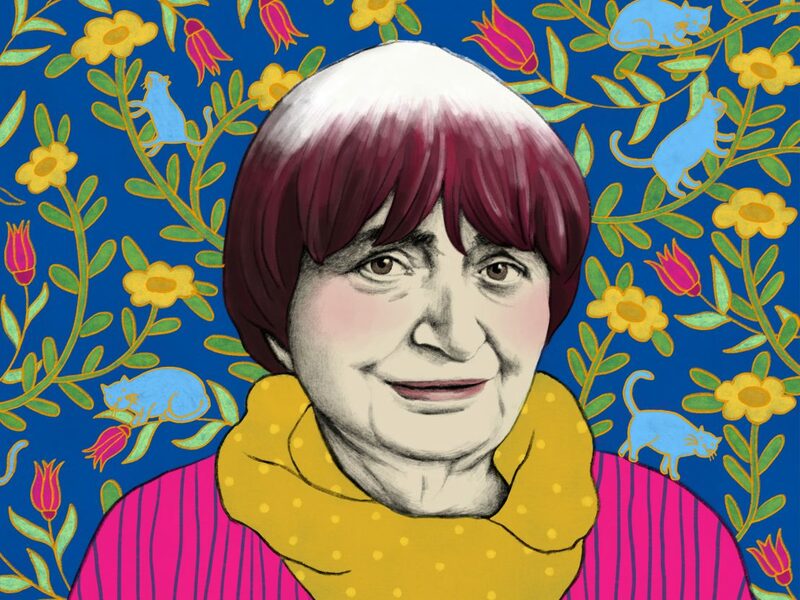 Eventually, Agnès Varda, 89 at the time of writing, enters the room – she possesses the air of an eccentric royal figurehead from a make-believe country. She jokes about how she’s never been commercially successful as a filmmaker, but if this is true, it’s because her films are cheerily nonconformist – the world has yet to catch up to her. Glancing back across her spectacular career, highlights include her path finding debut, La Pointe Courte, her bitterly ironic take on adultery, Le Bonheur, the delightful documentary portrait of her own street, Daguerréotypes, Venice Golden Lion winner Vagabond and her heartbreaking, ramshackle ode to France’s working classes, The Gleaners and I. 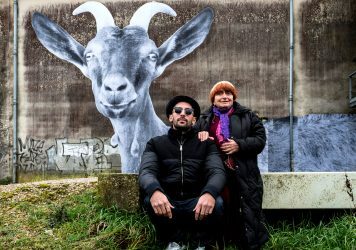 Her new film, Faces Places, sits cosily within her personal canon of greats, a tour around France in the company of conceptual photographer JR to explore the relationship between art and landscape. 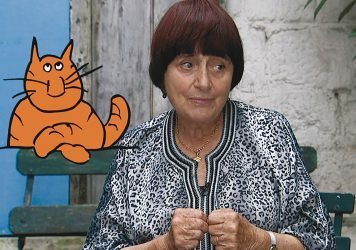 What follows is an unprompted monologue delivered by Varda upon entering the room. “I love to speak about cinema. I’m not selling anything. I guess you want me to talk about about Faces Places? I can speak about other things, you know. I hate to talk without JR, because we did the film together hand-in-hand. We did the promotion, we did the festivals, we did everything. When we met we had the same desires and the same feelings. We wanted to meet people who have no power. Trust, luck and chance brought us new things, new people, different people. “We had a magical truck. I fell in love with that truck. The little photo comes out the side. People love it. They paste them on the wall and they feel like there is suddenly a community. Showing images is a way of sharing. In some villages people say, ‘Sometimes we don’t get along, but putting our images together makes it better.’ We had in mind to go to different places in France. Near the sea, in the middle, in the south, in the north. We went to the north and we wanted to meet people who lived in houses that were built for the local miners. There are no longer mines so they should leave the houses, but we were told that some women decided to stay. “Chance brought us to a woman called Jeanine. We got along, and it was so interesting. She told us how sad she was at the passing of her father. It became something very warm, and when JR put her face on the house, she was so touched. If you have seen the film, you love Jeanine. That’s what we wanted. We wanted the audience to love the people we met and share something with them. When we played the film in her village she said it made the memory stronger. We built something everywhere we went. “We learned also about the agriculture of today, the way farming is so different from how it once was. I couldn’t believe that a man alone can cover hectares with his machine and spend all day speaking with his computer. We did sociological work, but with a smile and a sense of joy. We didn’t want to be serious and quiet. We shot one week per month over 18 months because I cannot do more than a week. We ran up and down the country, standing all the time. I’m strong, but not that strong. My daughter Rosalie – wonderful Rosalie! – used to be a costume designer but in the last five years she has begun to work for the company. I used to do everything, including producing, but she produced this film. She never said, ‘Hurry up’ but she always said, ‘Do your thing’. “The editing took quite a long time. For me the film takes its real shape in the editing, which I’ve always done. We put Jeanine at the beginning, so we have a real meeting with big emotions. Another example: JR had found one of the big block houses that had fallen from the cliff, and he wanted me to see it. I said, ‘Okay, okay, I have already seen that, I have seen many of them’. Then he gave me the name of the place, the beach, and I’d been there in 1954, taking pictures with a friend of mine, who became the famous photographer Guy Bourdin. So, we took the pictures we had made and went to see the house where he was living with his grandmother. Using the imagination, that photo became a little bed for a child and became a grave for my friend. With imagination, our feelings become something beautiful. We knew that the tide would take it away, so we were working with the desire to build something that we knew wouldn’t last. It was a beautiful grave for my friend Guy. His son was very impressed. “In all the places we went, we met people. One day I said, ‘We should have dessert, where should we go?’ My assistant starts to look and says, ‘I’ve found an abandoned village.’ I didn’t know about it, so we discovered that – a village that had been half built and abandoned. We sent a casting director a week before and I said, ‘Try to find people in that village and bring them on Saturday.’ So we invited them for a picnic, and they came. By making these images it was like a revival. We played a game with them. We had people agree to play roles. It was not a real family but we built a family from the people. We had a dinner with them and the grandfather would fall asleep reading his newspaper. It was like a documentary-fiction thing. And then we left. “Everyone who came gave her compliments. Her children said she was beautiful. It was like getting a piece of life everywhere, we wanted to take pictures and make portraits. It took us to the factory, and making jokes with them was like participating in their work. The factory workers said they had two days of fun, because we put fishes in the water tank, deciding they should swim in there. They saw we were a little crazy, but they enjoyed it – they helped us. It was allowing us to bring our imagination into the serious world of work. We were dancing with their life, proposing images, proposing a time of sharing. “That’s my point: I have always been doing documentaries. I made my first film in 1954 – you were not even born yet. And I have enjoyed meeting people. I have enjoyed sharing people with audiences. Small audiences though; I never did it for the money. That’s why I am surprised that they gave me an Oscar invite. In my speech I say how I never made money, but I got prizes and recognition. At the Oscars night I was looking around. Jennifer Lawrence, she’s worth $4 million. Steven Spielberg, $15 million [ed: actual worth $3.6 billion]. I was imagining their value in money. It was like a field of money. I told them I was not bankable. I couldn’t bring money to anybody. I enjoy getting awards and some admiration, but I don’t like to make a big fuss. I will just go on working as long as I’m strong enough. It’s nice to be recognised. When you get the Oscar, your price goes up and the sales are better. 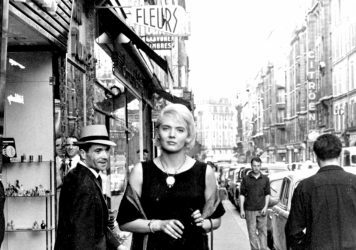 “The film of mine that is still best known is Cleo from 5 to 7. The most fun one is called One Hundred and One Nights. I did it to celebrate 100 years of cinema, and I assembled all the famous actors in France, which I thought was impossible. The film was a failure, but I enjoyed having all these actors visiting me. I don’t think you would have seen the film, because it was such a flop. I enjoyed that film terribly, but nobody else did. This one, which I did with JR, I enjoyed very much. We enjoyed the fact that we could, with 55 years difference between us, have the same desires, the same feeling with people. He’s very funny and easy with people. He has a truck with ladders and scaffolding and people jump on it and ask questions. 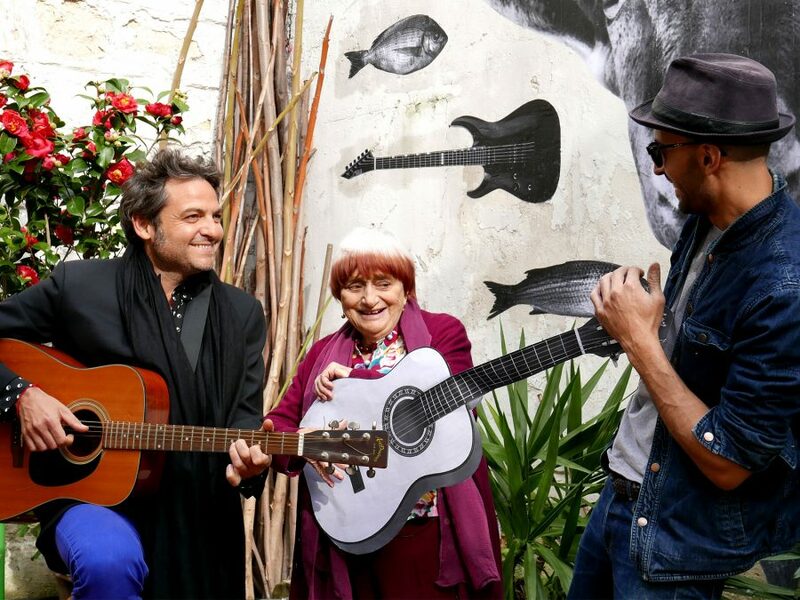 Faces Places is released 21 September. Read the LWLies Recommends review.